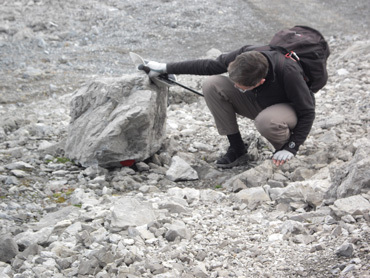 At last, 2009 was the year that Bill checked-off 3 items on his alpine activities wish list. The first 2 were dispatched in the Dolomites--though just barely. 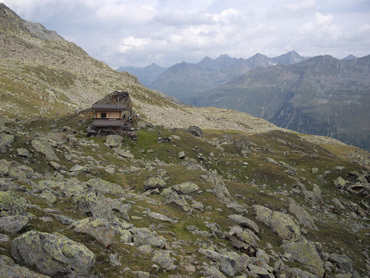 One longstanding desire was spending 2 nights in a mountain hut or rifugio so as to complete an otherwise out-of-reach Via Ferrata and to assess rifugio's suitability for future multi-day hikes. The second item on his list that was tended to was hiking in the Rosengarten group of mountains, an area we scouted a month earlier on our loaded bikes as we entered the Dolomites region. A third "hope to do" that had languished on his list, exploring more of the Tyrolean Alps of both Italy and Austria, was about to be crossed off too. Like the Rosengarten area of the Dolomites, the Tyrolean Alps had been a difficult to access by bike and required actually getting there to gather the needed planning information. But this year Bill had found ways to approach both areas for reconnaissance work without becoming locked-in to a unworkable plan. 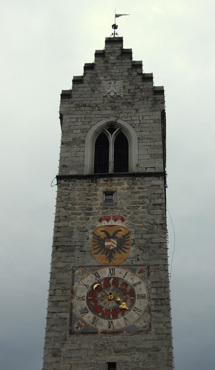 As soon as we dipped down from the Dolomites into the 'pre-Alps' city of Bolzano in the morning and had gone up the other side of the deep valley in the afternoon, we knew we were in a different region. It was a journey that could be made by car in less than an hour and yet a journey that passed through 3 different worlds. 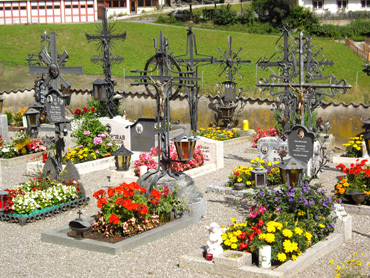 Iron instead of stone gave this Italian cemetery an Austrian look. Immediately I began asking Bill "Are we in Austria?" until a few days later he said "Yes, we must be in Austria." All of this northern part of Italy was Austrian until the collapse of the Hapsburg Empire at the end of WWI and yet the Austrian spin on the Dolomites area wasn't as striking as it was on Tyrol. The various valleys of the Dolomites each have a slightly different culture but they all reflect a reconciled tug-of-war between the Italian, Germanic, and local Ladin cultures. The Dolomites valleys don't shout "Austrian heritage" but rather murmur "Germanic heritage." German is a preferred language and the northern influences register to us as Germanic--a blend of German and Austrian--rather than one or the other as in this area. One of our Dolomite hostesses commented that Italy would be better off if it was more like Germany--curiously, she didn't say "more like Austria". 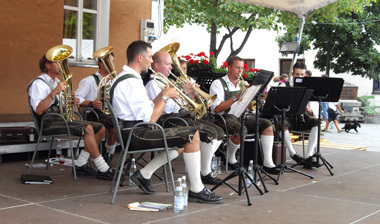 A beer-garden oom-pah band in Italy?? But in the Tyrolean region, it was Austria that clearly came to my mind. The forested hills and mountains with less exposed rock than the Dolomites reminded me of Austria. The shift from mostly stone and stucco barns and farm houses to those made mostly of timbers; the dark wood vestibules on posts for crucifixes; and iron grave markers in the cemeteries all made me think I was in Austria, not in Italy. And of course the folks in the hospitality industry underscored my impressions by being even more insistent on speaking German rather than Italian. "Austria" was continuously on my mind as we traveled north through the Valle Sarentina/Sarntal, over the Posso di Pénnes/Penser Joch, and arrived in Vipiteno/Sterzing 10 miles south of the Brenner Pass on the border with Austria. Vipiteno positively oozed with Austrian flair as an oom-pah band outfitted in embroidered lederhosen played in the town center flanked by shops with cute wooden facades and a 15th century clock tower sporting a Hapsburg-like double headed eagle. My reaction became more emphatic as I found myself saying "This can't be Italy" when I saw the sign for the "Getränkemarkt"--a beverages-only market we'd only seen in Austria and Germany where beer in glass bottles goes out the door in plastic crate cases. "OK, only in Italy" I thought as I noticed that the stack of empties out front also included plastic crates of glass bottles for mineral water. I did spot a 3-wheeled Ape--a slow moving vehicle that seemed to power some parts of Italy--and yet realized I hadn't seen (or heard) one for weeks. They are so iconic for Italian villages and back roads and yet the Ape's had been rare in northern Italy and are presumably illegal outside of the country. Everywhere we looked we thought "Must be in Austria...."
But my mind popped back to thinking it was Austria or Germany again went I started noticing the number of middle-aged and older sportswomen on bikes--definitely a rare, rare sighting in Italy. Suddenly serious female cyclists with the well-defined muscles to prove it were everywhere, including trio's of female cyclotourists. I had no way of knowing their nationality, whether they were local Italian women or visiting from the north, but there was suddenly a dramatic shift in their numbers as I would expect in Austria or Germany. And we both immediately noticed the bias when talking with a young tourist info clerk in one northern Italian town when she answered my question "Are things busy now because of a special event?" "No" was her response. She continued with "It's that the Italians are on vacation now." She said it in a slightly disparaging way that wasn't matched when I mentioned we'd seen a lot of visitor's cars from Germany. "Those Italians" we smirked--but she was one of them. Clearly her primary identity was other than Italian, probably "South Tyrolean." Everywhere I looked, I was seeing "Austrian" more often than "Italian." Even one Italian region's flag was red and white stripes like Austria's national flag with the addition of a small emblem. Red triangular "Zimmer Frei" flags were hung from some guesthouses, indicating "Vacancy," flags that I associate with Austria and Germany. Undecipherable Old German script started showing up on the "Gasthaus" facades, though in Italy the accommodations would be called an "Albergo". It was almost a relief when we crossed the border into Austria a few days later as I no longer had to reconcile the confusion about "Where am I?" It was immediately apparent that these Tyrolean Alps weren't as visually interesting to us as the Dolomites were, nor did they grab our attention the way the more western Alps of France had done in June. It didn't matter whether we were on the Italian side or the Austrian side, they didn't make a strong first impression. Even at the 7,000' these Alps were endlessly woolly green. In northern Italy some of the difference in visual impact was because the mountain valley bottoms were at lower elevations than in the Dolomites, perhaps at 2,000' compared with 5,000'. The mountain valley bottoms were where the lodging generally was, so it was where we spent our nights. In the Dolomites the mountain peaks and faces were right out our door; in the Tyrolean Alps the peaks were "over there and up" which didn't give the same sense of immediacy as we enjoy in the Dolomites. When I returned from a walk up the steep slopes of St Leonard, one of our Italian Tyrolean host towns, I had wet feet and grass stains on the cuffs of my pants. Even though I'd gone up another 1500' from our lodging, the entire trail had been through a damp forest floor--in the Dolomites I'd instead return with gray-white grit and dust on my feet from being above timberline. To have walked higher from this village of St Leonard would have required a car or bus ride to get out of the pasture land and forest to be above tree line and among the exposed rocky faces. The geology and the resulting erosion patterns also seemed more ordinary looking in the Tyrolean Alps than in the Dolomites or farther west where we'd been near the border with France. 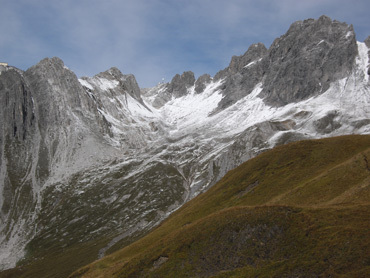 In the Tyrolean Alps, many of the mountain tops appeared to be covered by a green fuzz when viewed from a distance which diminished the contrasts. We later learned that the green fuzz was either the short, dense moor vegetation or lichens on the rocks. An old cable car, not the parked car, shuttled supplies. As we continued to travel west through the Italian Tyrolean Alps before heading north and crossing the border into Austria, we turned our attention to what there was to see. At lunch one day we again contemplated life in isolated homesteads on scant plateaus high up the steep mountain valleys. 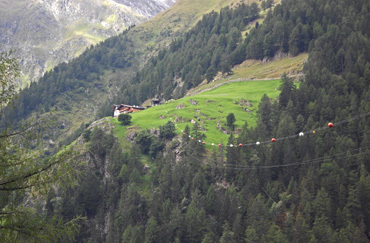 We happened to be sitting within feet of the cable car used by one such homestead. The old cable car had 3 steel milk containers and a newspaper in it and we imagined they were waiting for the bread or grocery delivery before hauling the car across the broad ravine to their house. "Did a helicopter bring the refrigerator in? How do the kids get well-socialized? Is substance abuse endemic in these households?" were among the issues we pondered as we munched lunch. The distance homestead served by its own cable car. 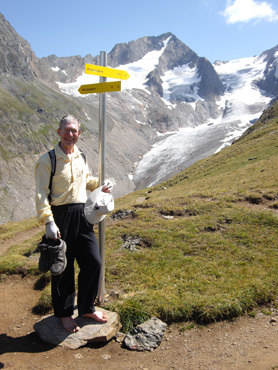 My first walks in the Austrian Tyrolean Alps were more of a meditation than a soaring adventure for me. I love being outdoors, I love being in motion, and the Tyrolean Alps were a good place to do both but the scenery didn't change very fast on my first outings. The soothing sound of rushing water was often heard as the wickedly steep glacier and then water-cut valleys frequently had multiple rivulets that were near-waterfalls. Both lingering snow and glaciers were still melting in the late summer and the water charged rather than meandered to the rivers below. But unlike the constantly changing look of the rocky faces, peaks, plateaus, and cliffs in the Dolomites some miles east, the Tyrolean Alps presented a more slowly changing scene. One doesn't miss much by studying the vegetation changes in the moor-like turf as the moisture level varies. 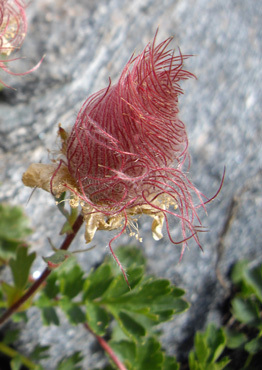 I was again stunned that there is so much dirt in the Tyrolean Alps as one can hike for most of a day in the Dolomites and only see patches of soil. There is something about the Dolomite rock--perhaps it is the rapid rate of eroding--that prevents much soil formation. The rock is very porous and so even in a rain storm, there are few puddles to step in. There is an occasion high meadow where dirt and grasses have accumulated, but usually it's rock--ranging from grit to barn-sized boulders--that one is walking on and around. 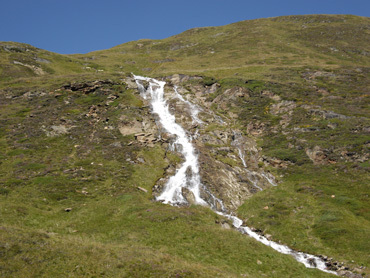 There were short waterfalls between glacier-formed 'terraces'. But in the Tyrolean Alps sod, dirt, and mud were often beneath our feet. It generally makes for softer, quieter, and more secure footing than the jumbled rock surfaces of the Dolomites. But we grew up in the damp Pacific Northwest with plenty of dirt and mud and revel in the cleaner, drier, and less slippery rocky terrain of the Dolomites. But the slowly changing scenery in the Tyrolean Alps meant that one could be lost in their thoughts and not miss much. Pausing to look up now and then was sufficient to see the very slow progression of the panoramas. In contrast, in the Dolomites every few minutes will often deliver a new experience of the near and distant peaks so it's best to keep the gaze high and active. The Tyrolean Alpine passes had little difficulty in reminding us of all of our shortcomings as cyclists. Bill had to be meticulous in his route planning to avoid the too frequent, ultra-steep grades that he knew were lurking between the peaks. Several years ago we were in an area of the Austrian Alps where the best road out of a hiking area had us pushing 2-to-a-bike up a posted 23% grade road. It was horrific, but it was the least-steep of the passes from which he could choose. This year he managed to limit the grades to 15%, which is definitely taxing but within our range. We huffed & puffed up to the high-elevation passes. Absolute grade is one issue but average grade and duration of sustained grades also matter. The last day of our 3 days of climbing to crest Timmelsjoch/Rombo Pass (I'll remember it as "Rambo" Pass) had miles of near continuous 10% grade. 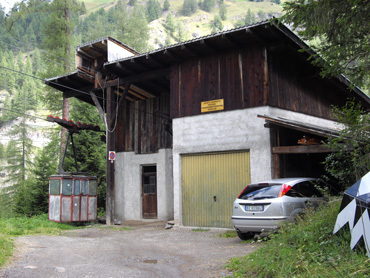 There was zero warm-up on the 3rd morning as our 'Gasthaus' accommodation was cantilevered on the steep slope where the more moderated road grade was 10%. The first pedal-stroke of the day was on a 10% grade which continued without relief for 1 km or a little over a half of a mile. Instead of a warm-up, we had to settle for resting our quickly exhausted muscles by pausing on the switchbacks when they finally appeared. We've learned to counter the rapid depletion of glycogen from our leg muscles that occurs on these grades that are beyond our training range of 6-8% grades with a steady stream of sugar from the get-go. The day before it was in the form of over 2 lbs of grapes that we devoured in the first hour of climbing; on this day miles from a market, we dipped into our reserves of dried figs, dried apricots, prunes, and a sugary ice tea mix to continuously bath our instantly sapped muscles with sugar. Lunch was served an hour early on these very taxing climbing days. But the Alps challenged us in almost every way and worse than a 10% graded road with switchbacks is one without. 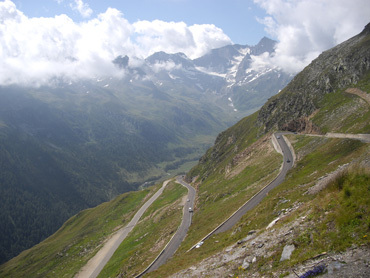 I became physically and mentally unraveled on one such road as we approached Passo Pennes earlier on our Tyrolean route. It had 2 very long, straight swathes of 10% grades. It was little more than a lane wide and when I finally had to stop for a rest, I couldn't restart--I had to push my bike. I lack the strength, and perhaps some confidence, to power start on a narrow 10% grade road. I need some slack coming from somewhere--a little less grade, a bit more lane width, a little banking of the surface, or a driveway so as to get underway with my available power on a loaded bike. Fortunately on that day I unraveled on what was the very worst spot on the route and part of why I became so discouraged was that I thought it was only the beginning of the worst of the road. Once Bill and I had pushed me to where I could restart, I was able to continue because of the slightly decreased grades or shorter durations of the 10% grades. see when we biked over the pass but did on a return visit by bus. And then there was the matter of coping with the thin air. The morning we headed out for our final assault on the Timmelsjoch pass we were on a sustained 10% grade and at 1900m or 6,200'. That elevation is short enough on oxygen that we notice it right away and had to factor this additional challenge into to our overall strategy for pacing ourselves to the top of the pass at 2509m or 8200'. Narrow roads, steep roads, roads that are too straight to start on, high altitude--what else could torment us? The drivers. Unfortunately when we were there, the Tyrolean Alps on the border between Italy and Austria attracted some dangerous drivers. In the Dolomites we've sometimes felt harassed by the packs of motorcycles but, for the most part, we've become accustomed to their antics. But for too many days in the Tyrolean Alps we were buzzed by an excessive number of reckless drivers. We were shrieking from fright and screaming in protest multiple times in a single day at drivers that treated us like objects on a slalom course. Usually it was the Italian drivers that harangued us, though a notable German or 2 also provoked our rage. Whenever we were in a tight spot on the curves and a driver was patiently idling behind us and often backing up traffic in the process, we'd look in our mirrors to see that it was invariably one of the northern guests. Lucky for us they at times represented half the drivers on the road, so we were recipients of care and consideration over and over again. It took resolve on their part to counter the local driving culture by driving so safely but we sure appreciated it. We wondered how frayed the nerves were of these excessively polite German, Austrian, and Dutch drivers as they struggled to survive the antics of the local Italian drivers. We've become accustomed to the 'close' game many Italians play but the guys out on these roads were just plain nutty. The only challenge we didn't contend with on these big climbs was the heat. On most of our climbing days in August we often had relief from the potential overheating because of the scattering of clouds. We might be sweating buckets from the sun for an hour or 2 and then usually a few clouds would roll in to keep our level of heat stress low for the day. 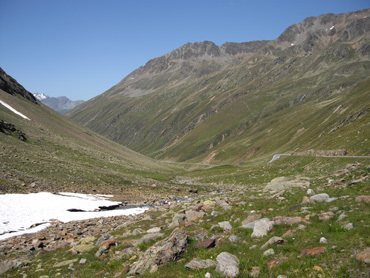 Obergurgl is nestled in the bottom of a glacier-carved valley. 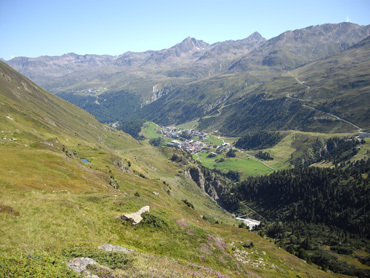 Bill selected the tiny village of Obergurgl on the Austria side of the 8,200' high Timmelsjoch pass for our next hiking destination because it was a high altitude area with a number of hiking trails shown on his map. Only a single cable car was running for the summer hiking season, but he thought it would give us sufficient access to the better trails. He had reserved our fully equipped ski apartment for 5 nights but we quickly extended our stay to 8 nights, then 15. It wasn't that Obergurgl or its hiking venues were so grand but it was a place with the right combination of features at the right time. It was the peak of high season in Europe and yet our fresh, new, and bright apartment with 2 balconies was one of our cheaper, higher-quality abodes for the year at 44€/night or about $60 for the 2 of us. Bill loves to have a pleasant place for additional "in" days to putter, to do online research, and to read and yet I need to go somewhere everyday. Like in Selva, we had a 2,300' high trail right out our door at Obergurgl, so I could "go" everyday without any planning or transportation overhead. I'm committed to 2 hours of aerobic exercise a day and I need to maintain both my CV fitness and leg strength so I can bike out of these mountain valleys that we bike into, so a hard, steep trail is a perfect conditioning course for me. Obergurgl was ideal: a nice space for Bill's "in" days and venues for my "go" days. 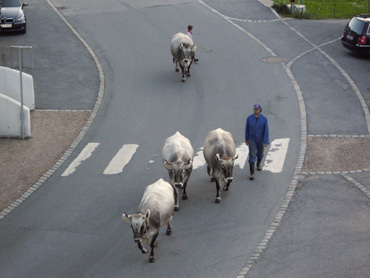 The "girls" passed by our main street apartment twice each day. English news on the TV and high speed internet for an extra, per day fee were the icing on the cake, so we settled in for a long stay. Every other day we did a full-day hike together. On the alternate days, we'd entertain ourselves separately and use the computer while the other person was out. A bathtub and access to a clothes washing machine was all that remained on our wish list. The single food market in town barely met our needs, but it was sufficient to support our stay. The alcoholic beverage and salty-snack aisles were large and prominent but at least they had left room for a fresh produce section. And even though they were missing some of our favorites, the little market had 2 items we look for when in Austria and Germany: alcohol-free "Radler's"--a beer and lemonade mix; and Lebkuchen ginger cookies. We maintain a strict diet but these are treats we indulge in when they are available and Obergurgl had both. By the time we left Obergurgl, we recognized that what it didn't have made for a more peaceful stay. It didn't have a large number of grand hikes, so there wasn't that sense of pressure to make good use of the time, as in Selva in the Dolomites. In Obergurgl many of the outings were just good enough and there was no great loss if some were left undone. In fact, several were repeated or repeated in part because the list of hikes to do was short. So, the self-imposed performance pressure was off and we had a tranquil stay in this village where cars are banned from the streets from 11pm until the first bus rolls through at 6 am. 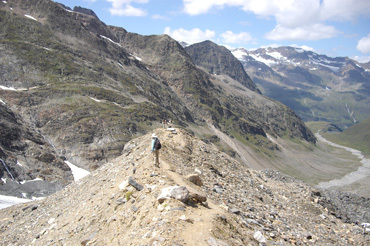 Obergurgl's hiking opportunities were more modest than those we enjoy in the Dolomites: the number of trails was smaller and the length of most of them was shorter than out of Selva. In the Dolomites, many of the best trails that are within our ability range are so challenging that we can't linger, we always have to rush. Lingering may mean missing the last lift down out of the peaks for the day or the last bus back to the village, so we have to stay on task during the entire outing. The pay-off for this rushing is that we get to see some exceptional sights, though we don't get to look at them as long as we'd like. But that wasn't a problem at Obergurgl. 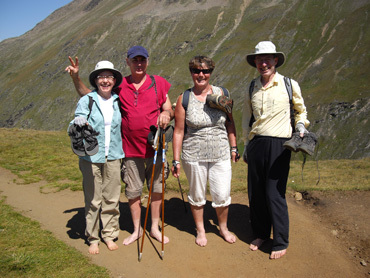 When hiking from Obergurgl we learned to expand the ways in which we lingered with each outing. One day we amused ourselves with tossing large rocks into a small rapids area to create the stepping stones needed to reach a plank walkway over the rushing stream rather than barge ahead. And a bit later when the trail returned to the first bank, we spent more time than we'd have spared in the Dolomites looking for the best crossing point. When a bit of glacial geology caught our eye, we'd take the time to detour to walk up to it, on it, or around it as was necessary to appreciate the details. An oddly cracked or scoured rock was worth being called back for further inspection and discussion. 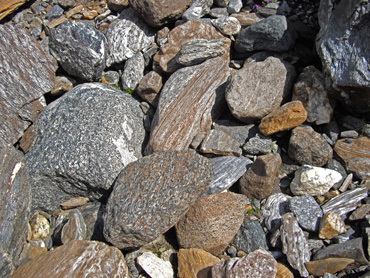 ...and to inspect the striated & speckled rocks. And it was in Obergurgl that I had my first opportunity to trial-run some footing tips that I'd recently read on a mountain running website that I thought might solve some of my muscle soreness and balance problems. So while on hikes together and alone, I took the time to experiment with the new concepts. When with Bill, he played devil's advocate in our discussions about the new approach and together we explored the pro's and con's of different foot placement strategies. It was sweet to be able to take the time, to experiment, to explore technic. We also lingered longer at our trail-side lunch spots to watch other hikers to see what we could learn from observing their hiking postures. As usually was the case, there was only one hiker in several days of scrutiny that looked like an exceptional role model: a person who looked like they'd mastered the right technic and we could identify what "right" was. My mental image of him got catalogued with the hand-full of other inspirational figures I'd seen on the trails the last couple of years--an image I'd call-up when doing steep descents so as to advance my skills. The views from the top of the cable car area were stunning. Obergurgl, at 6,200', is literally at the end of the road running up the Ötztal Valley, a valley decisively carved by glaciers. 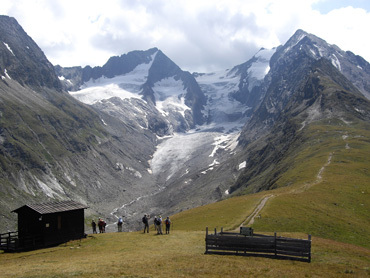 This upper end of the Ötztal Valley is most striking because everywhere you look you either see a current glacier or the obvious effects of a glacier from the end of the last Ice Age, which was about 10,000 years ago. The single cable car that operates in Obergurgl in the summer takes visitors to Hohe Mut at the 8,700' level and immediately delivers stunning views of perhaps a dozen glaciers. Any one who wants to go no further can be mesmerized by them and the numerous 10,000' peaks from the wind-sheltered sun terrace of the restaurant at the top of the lift. Those willing and able to hike in the thin air can see another dozen or 2 glaciers by walking towards them on a well-worn sod trail. Barb walking on top of a loose rock ridge churned by twin glaciers. Looking up, down, and around had us struggling to recall our knowledge of glaciers and the associated vocabulary in both English and Italian. Everywhere we looked we saw hanging valleys that had formed at the edges of some glaciers. There were deep bowls, extensive carved ridges, and massive piles of rocks and boulders that had been churned along with the flowing ice. The enormity of earthmoving process was hard to miss if you looked up. The narrow rocky plateau 2,000'+ above our apartment. Any hike out of Obergurgl meant hiking on glacier carved land. Our trophy hikes and trophy photos from Obergurgl were taken from the upper end of the valley with a boost from the cable car. In contrast, our short hikes always began from our apartment at the valley floor, the main glacial valley. But from there we'd head straight up the sides of the valley, walking through thinly forested land and pasture as we scaled the steep sides. After about a 2,000' ascent, we'd be on an upper ridge or narrow plateau that was about the same elevation as the upper end of the cable car. These ridges formed a base for the high peaks and 'neighborhood' glaciers. We could choose to continue up to the peaks or meander through the rock-strewn moors with the occasional sheep and glacial lake depending upon how much time we wanted to invest. High above Obergurgl one afternoon we couldn't resist the temptation of the sometimes-sod trails to test the premise of the author of "The Barefoot Hiker." Grinning at the prospect, we immediately plopped down on the grass to remove our footwear. 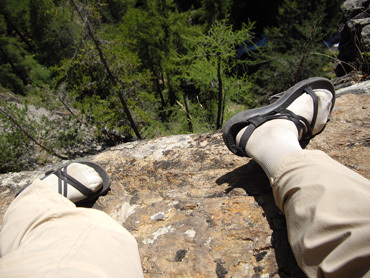 I took-off in a flash, not wanting to hear the chiding from the German-speaking hikers we'd just passed as they tend to consider it their duty to reprimand me for hiking in sandals--can you imagine what the sight of bare feet would provoke? I went scurrying off in the dirt with my socks and sandals in hand and let Bill fend for himself with the potential critics. 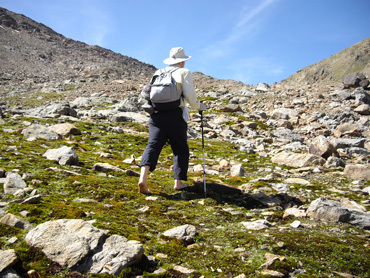 We each charted our own course, being able to take our chances with the occasional sharp stones on the sod track or walk on the lichen and grass turf several inches above the narrow animal trail. Pausing to celebrate a triumph. Very amused with ourselves and delighted to make it to our next trail junction with no damage to our feet, we paused for a photo. We both kept nervously looking back, wondering why the German speakers hadn't caught up with us. As Bill was posing for his photo, our jaws dropped when the couple finally approached and we instantly understood why they'd lagged behind--they both had their boots slung over their shoulders. The barefoot Germans headed towards the cable car station that was in sight while we paused to re-shod our dusty feet for our rocky trail to the bottom of one of the smaller glacial valleys in the immediate area. After all the criticism we've endured over the years for our footwear, it was an absolute delight to discover that we'd inspired others to break out of our shared cultural confines for a bit of fun. We didn't know that barefooting was contagious. We so enjoyed our 10 minutes of barefoot hiking that we tried it again the next day for over a half an hour on another mostly sod trail on the upper ridge above our apartment. We quickly learned that it wasn't the tenderness of our feet but the hysteria in our brains that was holding us back. It seems that our feet had been so shielded from the sensations of the world that every new bit of the input from them to the brain registered as peril. After 20 minutes of barefoot hiking we could both feel that our brains were recalibrating so that instead of feeling that the feet were under siege with every step, we were increasingly released to enjoy the experience. Feeling and hearing spindly lichens intermingled with stubby grasses crunch under our step was amusing as was discovering the different textures of the other species in the pale green carpet of these high elevation moors. We both looked forward to the occasional few steps in the powdery dry dirt patches on the trail as we knew it would only trigger the sense of soothing softness. Most surprising was the unpredictability of stepping on large rocks as some were more prickly that we'd imagined whereas others were effortless to traverse. 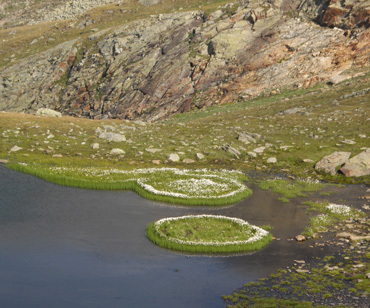 Bill was especially piqued by walking on a seam of quartz in one large rock; my top sensation was the squishy coolness of mosses edging a fast-flowing glacial melt stream. Bill fearlessly heading for a summit above Obergurgl. The more we walked, the more adventurous we became. Our mostly flat trail in a grazing area turned up into a boulder field and then onto a steep dirt trail strewn with gravel-sized rock debris. We slowed and recalculated our moves with each new challenge and were stunned with our accelerating adaptability. By the time the trail became an open grassy field, I was walking at my normal speed and no longer carefully inspecting the surface before stepping. We had no illusions of becoming full-time barefoot walkers like the local farmers had been until recent times, but our paradigm about walking on the land had changed forever. And 'all that dirt' on the Tyrolean Alp's trails was now looking like an opportunity instead of a liability. 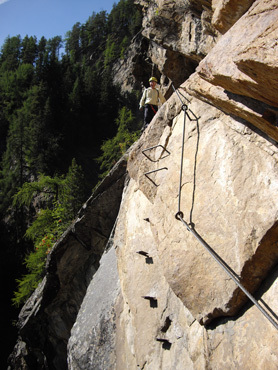 A startlingly different style of Via Ferrata. We'd mailed home our Via Ferrata equipment to lighten the load over the several passes we'd traverse on our way into Austria, but Bill couldn't resist the temptation of one last climb along the Lehner waterfall outside of Längenfeld down the valley from Obergurgl. He called ahead and indeed, we could rent the equipment we needed. Fortunately the route was shorter than most in the Dolomites so we had time to make the 30 minute round trip bike ride into town in the morning to pick-up the gear and again at the end of the day to return it. We were amazed at how different the demands of this climbing route were from the other Via Ferratas we had done over the last 4 years. In the Dolomites, we are accustomed to endless choices of hand and foot holds in the fracturing rock and constantly reminded ourselves to use the power of our legs and not the strength of our arms to complete the courses. This Austrian route couldn't have been more different from the Dolomite routes. Our Austrian waterfall route was on granite and there was 1 and only 1 way to navigate the course. It seemed that more foot placements were made on installed rebar rungs and steel toe platforms than on the rock itself because of the few natural holds. We never had to decide whether to ascend on the right or left side of the wire as we often do because on this Austrian route the foot supports were always to the left of the wire. It was a dramatic, "airy" route that allowed us to often traverse near-vertical walls with little athleticism because of the certainty of the footing and the security of the wire. Who could forget the climbing mantra: "Trust your feet". The route didn't however allow us to use the power of our legs much as the placement of the foot supports usually required hoisting ourselves with the strength of our arms. Unfortunately the 'left sidedness' of the route meant that my still-recovering left shoulder had more hoisting demands put on it than it had encountered since I dislocated it in April. By the time we hit the 30° overhang at the end of the course, my shoulder had had enough. I'd hoped to make a second attempt to master the overhang, but decided instead to let prudence prevail and I took the optional side route. Bill however made it up and over the very difficult overhang--Bravo! Bill. As we debriefed the experience at the top, we noticed several German-speakers folding up long white ribbon-like loops as they tucked their harnesses into their backpacks. Later we surmised that unlike us, they'd probably hoisted their backpacks up the short overhang with these straps instead of having their packs swinging off their backs as we had endured, which would have made it easier. We made a mental note to carry a cord with us on our next Austria Via Ferrata just in case there was another overhang to surmount. The Ötztal Valley river intersects the Inn River, which we followed to Innsbruck for a week-long stay. 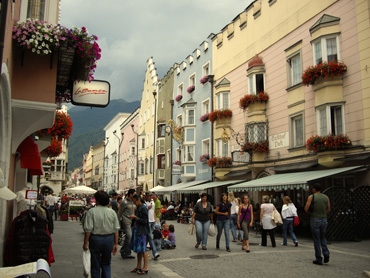 We'd never been to Innsbruck and enjoyed exploring the city and surrounds. We had watched for days as Hurricane Danny taunted the east coast of the US and while in Innsbruck, it was our turn: a long weekend of too-cool temperatures and 1 very wet day were our experience of what was then "remnants of tropical storm Danny." A diminished Danny and some of his unnamed friends brought days of strong winds to the areas north of us, though they didn't quite make it to us. 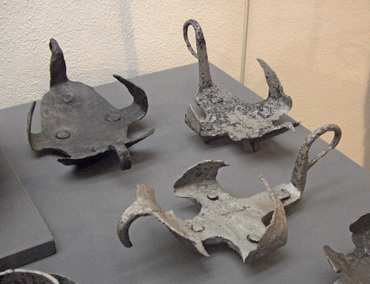 Roman horse crampons for crossing Brenner Pass. The string of Innsbruck museums were pleasant but few of their exhibits made lasting impressions upon us. One decidedly unpleasant image that we'll want to forget was that of eating bread so hard that it had to be soaked before it was edible. For some reason the Tyrolean's only baked their bread 2-3 times a year then stacked it in ceiling racks out of reach of the rats and mice. When it was time to eat it, a good soaking was in order or else it was smashed into small bits. The most exciting museum item was a new-to-us Roman find: horse crampon's for traversing 2 Tyrolean passes, the Reschenpass and Brenner Pass. I love tracing the early development of familiar objects and processes and so much technology goes back to the Romans or earlier that we always scour exhibits of Roman times for yet another item with an ancient past. It is of course getting harder and harder to see 'a first' and it's always fun when we spot one, like these crampons. 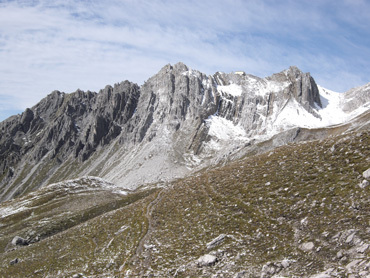 Like the museums, Innsbruck didn't deliver on the hiking venues as we had hoped. Innsbruck is quite low, at about 1,500', so all hiking had to begin with a ride on their 3-staged ski lift. At 25€ or $37 per person for a single round trip, it wasn't inviting to take it more than once during our week-long stay. So it was back-to-the-maps for Bill as he looked for a town with cheaper lodging and more hiking options for our last hiking venue of the season. A snow storm dumped 4" during our 1st hike. When it came to good-value hiking venue, St Anton delivered what Innsbruck hadn't: a charming ski apartment for about half the price of our so-so Innsbruck lodging and a 33€ ($49) lift pass good on 2 different multi-staged lifts for a full week. At St Anton we could again kick-back and enjoy the conveniences of a kitchen at night and grand panoramas on our daily hikes, all at "budget-relief" prices. However our first rude surprise was a snow storm that dumped about 4" on us during our first full-day hike out of St Anton. Fortunately we were prepared and it was a single day event, though some of the higher elevation snow lingered for days. The hazards created by the fluke snow storm were forgivable but we found our St Anton hiking routes increasingly and unnecessarily dangerous. Unlike at Obergurgl, there was a huge discrepancy between the advance information about the trails and what we actually encountered on them. When we got to the final 45 minute scramble on a mid-stay route, it was posted "Experts Only." We had no choice however: by cautiously pressing on, we arrived at the lift as it was closing for the day. Had we turned around, we'd wouldn't have arrived anywhere by nightfall. A few days later the snow still highlighted our trail. And we renamed our final hike in St Anton as "Flight 644" in honor of Trail #644 that we hope is the most dangerous trail we'll ever do. It was marked as the equivalent of a "2" on a 5 point scale with "5" being the most difficult. We'd happily done routes over the entire range before but a 20-30 minute segment of this one was insanely dangerous. When Bill inquired at tourist info and checked online line the next day, there was no indication anywhere as to the frightfulness of this narrow, sloughing trail that was chiseled into a sheer ravine wall. It was little more than a goat path which we oh-so-carefully inched along testing almost every foot step before committing to it. It too was a no-turning-back situation as in this case by continuing on we did miss the lift and had to walk down the mountain. Fortunately it was a lower elevation hike so that we made it to town about an hour before dark after a longer than expected walk. We loved our gracious ski apartment in St Anton and the inexpensive lifts and I appreciated the shoulder rehab opportunities at its public pool and fitness center but the unpredictably dangerous trails will likely keep us from going back. Finding the trail marker wasn't always useful. I had lamented leaving the Italian Dolomites at the end of July as I was getting a flood of new information as to how I could improve my hiking skills, both by refining my stance and changing the use of my feet. But quite unexpectedly, our 3 hiking venues in Austria were each different and each provided plenty of opportunities for testing the theories and increasing my competency. By the time we were wrapping up our stay in St Anton in late September, I felt like I was on the verge of mastering bipedalism. 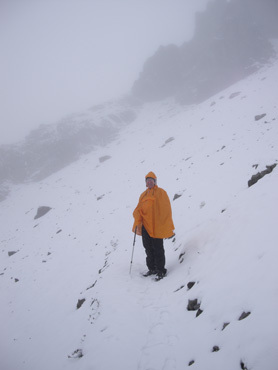 After all these decades of thinking I knew how to walk, I had a new confidence in my ability to stay safely upright in a range of challenging conditions. It was also at St Anton that I formed a new image of myself. I'd been looking for a souvenir pin of a mountain goat to celebrate my newly acquired speed and sure-footedness, but couldn't find one. But it was a trip to a fitness center which was intended to help me evaluate the rehab of my dislocated shoulder that signaled I should be looking for a kangaroo pin, not a mountain goat. One of our last looks at the high peaks for the year. After 7 weeks of hiking and biking in the Tyrolean Alps, we had gone well beyond satisfying Bill's wish to sample the region. We hadn't exhausted all of the possibilities but we had a much better sense of the area's opportunities and how to match them to our needs. But it was now late September and it was time to leave and we weren't happy to be going. 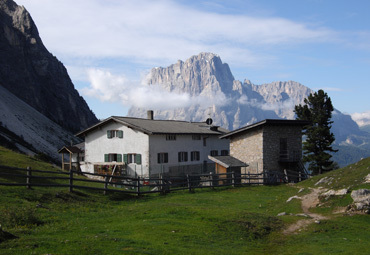 Like in the Dolomites of eastern Italy, we'd enjoyed the pleasures of renting furnished ski apartments for weeks of summer hiking, amplifying the contrasts with our usual traveling mode. Normally we are on the bikes almost every day and staying in a different room each night for weeks at a time. In Tyrol we were instead coming back to the same room at the end of each day for a string of nights and exploring the world on our feet instead of from the saddle. "Staying put" is definitely easier and it is seductive. But even though we'd extending the hiking season by moving from Italy to Austria, it too was closing for the season. It was time to move on. Reluctantly we scrubbed the mud and cow manure off of our hiking footwear for one last time, tightly folded our back packs, and then headed west on our loaded bikes towards a couple of low passes. Soon we been at lower, warmer elevations in southern Germany and Switzerland as Bill plotted a route towards Portugal where we planned to end our touring season for the year. We are currently in the middle of France, kind of in the middle of nowhere. We've been on our bikes almost every day for the last 3 weeks since we left the Tyrolean Alps of Austria and St. Anton. Bill isn't sure that we'll make our goal of being in Portugal by December--in the neighborhood of 1200 miles--but we'll keep pedaling like we will make it. No doubt at some point we'll have to accept a lift from a train but decided to double our benefit from the it and also use the train as a way to escape the storms when they finally clobber us. But so far it's just been a rain day here and there, though today it turned markedly colder and windier. Concurrently, we are busy planning our return to the States the first week in December and our return to Europe in early March. This is always a chaotic time of year for us as we make appointments and long "to-do" lists for being at home while Bill plans our current daily riding route and we make reservations for March.